Who said fashion was only for women? Being stylish cannot be limited to any gender as anyone who wants to look Peppy has to just style himself right. Fashion is not about going with the trend but looking trendy and peppy in whatever you wear! But guess who decided to go against the same old suit trend and make a difference with his quirky and highly peppy outfits? Ranveer Singh! This man is a great actor. I have loved his acting skills since day one when he starred in his film opposite Anushka Sharma in Band Baja Baraat. He has simply improved since his first movie getting in my favorite actors list. It's interesting how Ranveer has a peppy and chirpy, fun-loving nature even off-screen. Wherever he goes he amazes his audiences with his humour, chirpiness and ability to adapt with his surroundings. The peppiness of this amazing actor does not just end here. 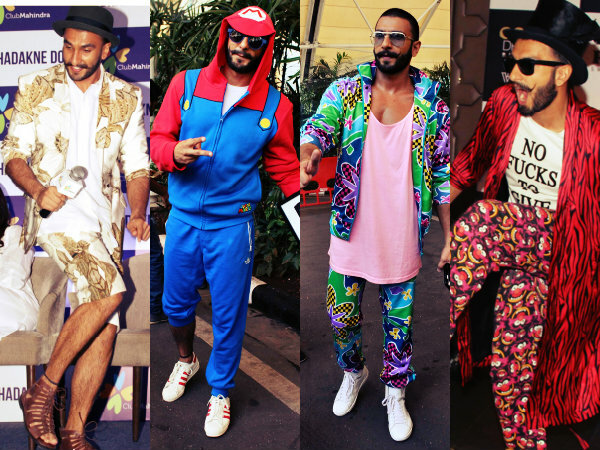 Ranveer likes his choice of clothes to go with his fun-loving nature. He has experimented with some crazy outfits no man would ever dare to wear. 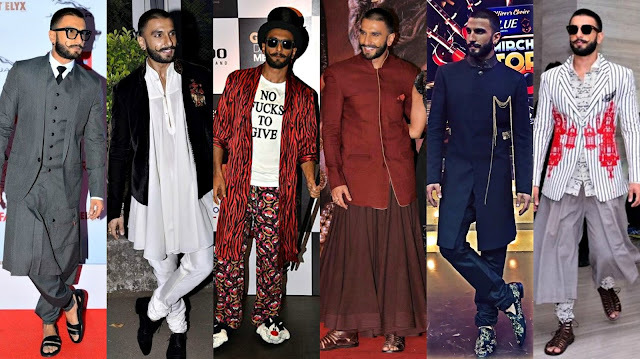 In the fourth pic above you can see that he is wearing a maroon sharara type pants and totally killing it. I am sure no one has dared to be as experimental as him. Kudos! He has dared to try everything from floral prints to bold Tees and even printed shorts. Going by his majority of appearances, I assume this actor loves hats. Every time we spot him, he is like a model who just walked out of the ramp with the latest designer labels. Some of his outfits are more daring than what male models have to wear on the ramp. The best thing is, he carries every look with grace and looks stunning all the time. With all his out-of-the-box appearances, it didn't take long for this stunning actor to bag the trophy of a super cool Men's fashion icon from the world of Bollywood. He is one of those inspiring actors who started from the scratch and didn't have a producer Daddy who would make everything available on a platter. He was chosen for his first movie based on pure merit and Bollywood for sure needs more inspiring stars like him! So Men, are you game enough to experiment like the daring and Suave Ranveer Singh? Ditch the same old suit and start experimenting like this amazing actor and fashion icon!